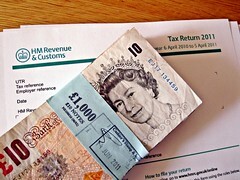 LONDON – Advisers in the UK caught peddling illegal tax evasion schemes may soon be stung with penalties of 100 percent of the taxes they helped evade. The UK HM Revenue and Customs has issued a new consultation documents proposing significantly harsher penalties for accountants and advisers who help their clients skip out on their tax obligations. Under current regulations individuals and businesses who are found to have used an illegal scheme to avoid or evade taxes may be charged significant penalties, however, the advisor or accountant who actively promoted the scheme used is not liable for any penalties. Under the proposed new rules, the offending advisor may be penalized and required to pay a penalty equivalent to the entire amount of taxes dodged. If enacted, the new changes are expected to not only cut down on tax evasion in the UK, but to also reduce the size of the market in the UK for illegal tax evasion schemes offered by unscrupulous advisers.